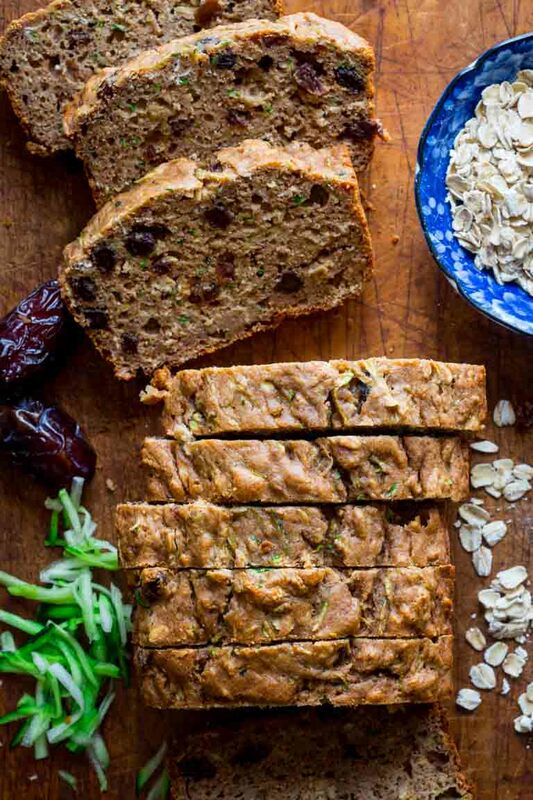 This Healthy Zucchini Oat Bread is packed with zucchini and sweetened with dates raisins and a touch of honey instead of refined sugar. The oats make it sturdy enough to pack in a picnic basket or lunchbox. 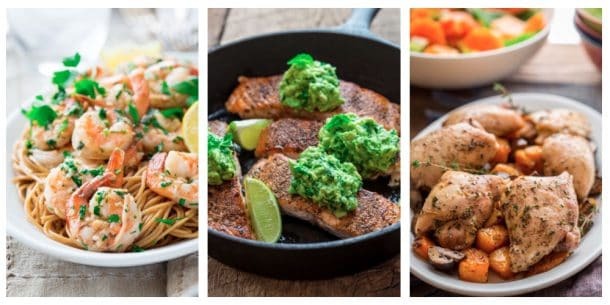 I originally shared this recipe on September 5, 2012. I have updated the images and some of the text today. 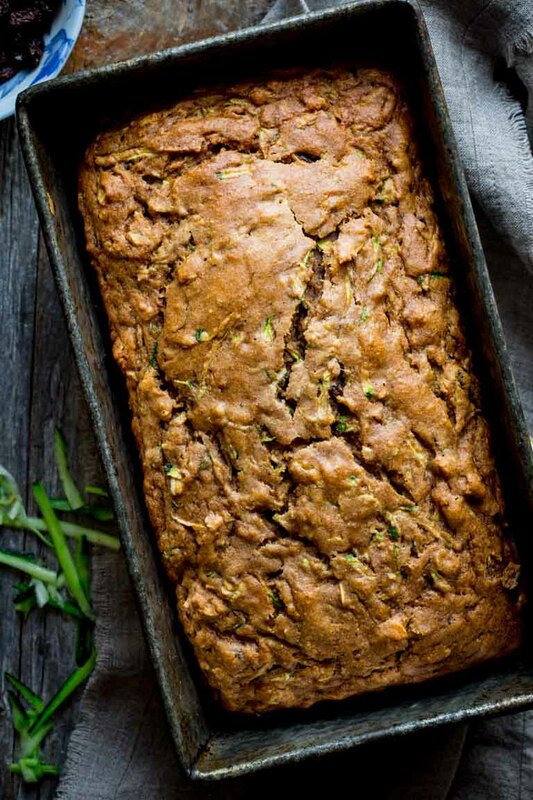 Have you ever noticed a lot of recipes for zucchini bread don’t really call for that much zucchini? I sure have. 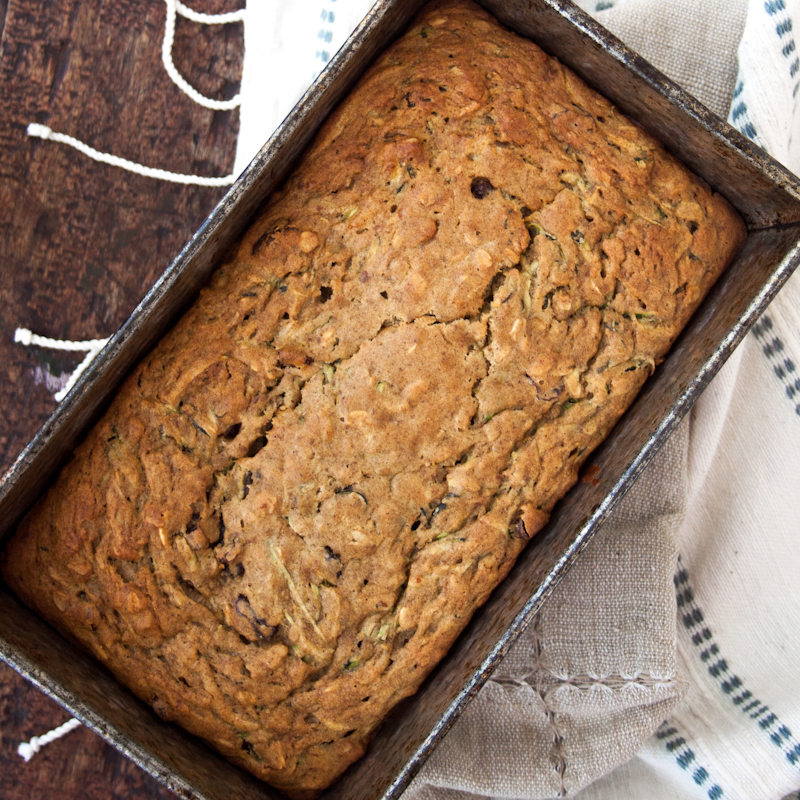 On its surface, making zucchini bread seems like an excellent way of using up lots of zucchini. But in reality, a lot of recipes only call for 1 cup! That’s hardly enough to make a dent in the excesses of the ever-present green giants this time of year. I mean seriously, what’s the point? You’re not even going to get much of a health benefit from such a meager amount. So I set out to make a recipe for zucchini bread that would use up a significant amount of zucchini. Sturdy enough to pack in a lunch box. Sweetened with dates instead of white table sugar. Made without gobs of butter. As it turns out, I did have to test it a whole bunch of times. But happily, the recipe I ended up with satisfies all of my criteria. Here’s what I did. I wanted to be able to freeze slices of the loaf so my daughters could pack them in their lunch boxes. To make the slices sturdy enough to handle the freezing and thawing and jostling I added oats. 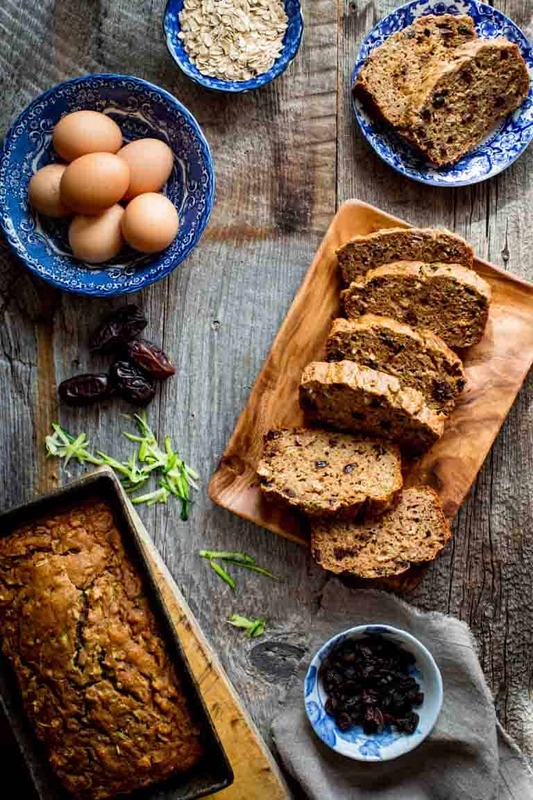 The oats helped make the slices more dense, higher in fiber, and they absorbed some of the moisture which actually helps keep the bread nice and moist. 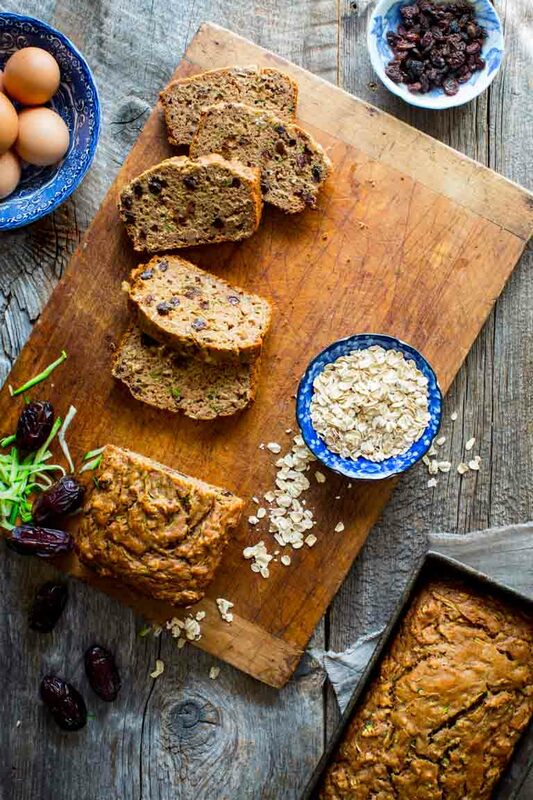 I was able to sweeten the bread with softened and pureed dates, which are naturally sweet but low-glycemic and high in fiber. 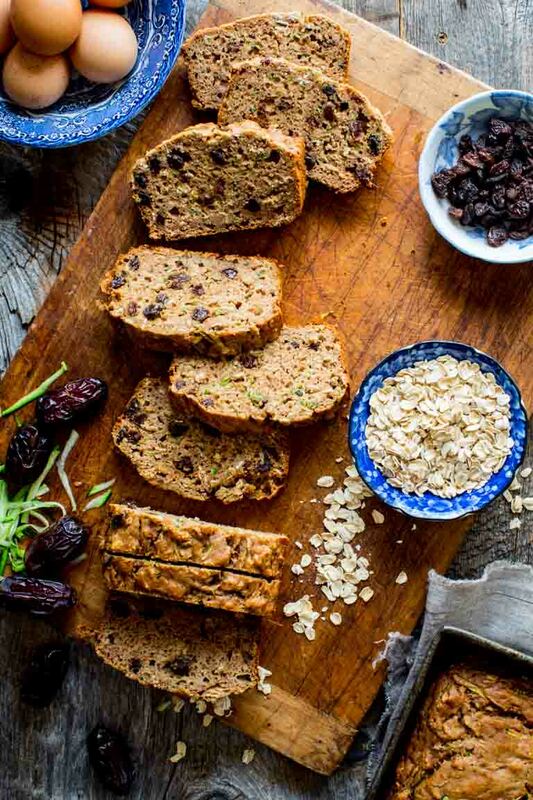 To that, I added only 3 tablespoons of honey, and a cup of raisins, which gives the bread a nice natural sweetness. [Enough so that my girls asked for another slice for dessert last night!] Considering that even healthy zucchini bread recipes call for at least ¾ cups of sugar, I consider this a real success. As with many of my baking recipes I used organic oil instead of butter. And I called for whole grain flour instead of all refined. This time, I used white whole-wheat in a ratio of two-to-one with all-purpose flour. The flavor is not overwhelmingly wheaty and the loaves rose into pretty golden domes. Preheat oven to 350 degrees F. Coat 2 1.5-quart loaf pans with cooking spray. 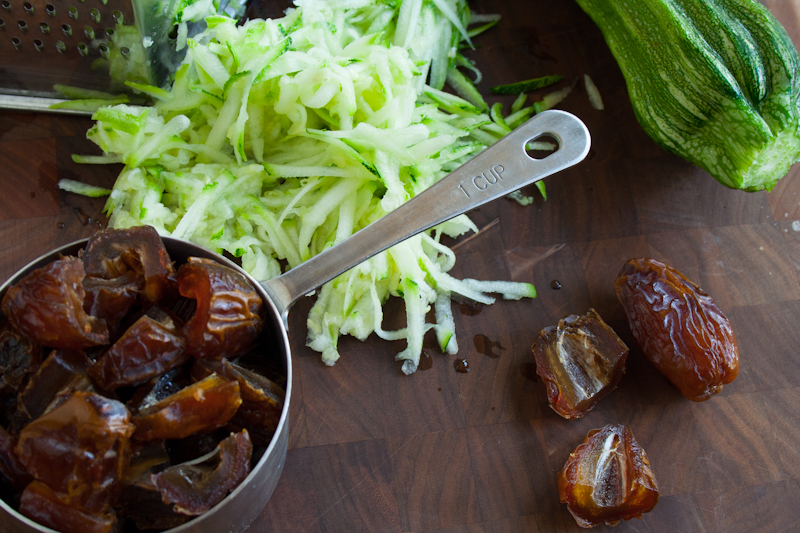 Pour boiling water over the dates and let sit until softened, about 15 minutes. Meanwhile, whisk whole-wheat flour, all-purpose flour, spice, baking powder, baking soda and salt in a medium bowl. Transfer dates and their soaking liquid to a food processor and process until smooth. Add eggs, oil, honey and vanilla and process until smooth. Pour date mixture into a large bowl. Stir in zucchini. Add the flour mixture and stir until just combined. Add the oats and raisins and stir until just combined. Divide the batter between the two prepared pans. Bake until golden brown, puffed and a toothpick inserted in the center comes out with moist crumbs attached, 55 minutes to 1 hour. Allow loaves to cool in their pans at least 15 minutes before turning out onto a wire rack to cool. To make ahead: Wrap slices of bread in plastic wrap, transfer to a large re-sealable freezer bag and freeze up to 1 month. Defrost in microwave for about 20 seconds or at room temperature. Yum I love zuchini bread and yours look delicious! 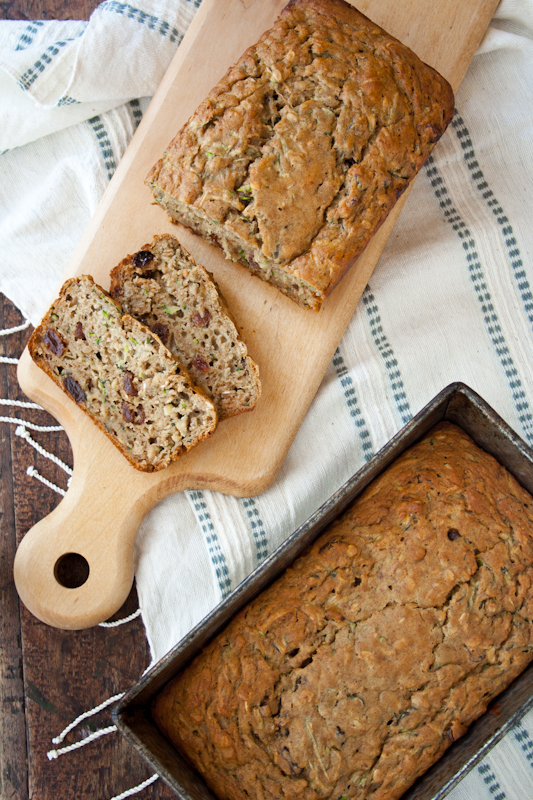 I was just thinking I would make some zucchini bread – thanks for a healthy looking recipe. Why do you prefer canola oil over butter? I prefer canola to butter for certain uses. In general, I try to limit saturated fat from butter when heart healthy monounsaturated oil will do the job. Sometimes a bit of butter really helps the flavor or texture of a recipe, and in that case it wouldn’t make sense to swap it out. By far the best zucchini bread I’ve ever made!!! I’ve e-mailed it to my friends that have gardens overflowing with zucchini. So cool to hear that Dom! Really that makes me so happy. Do you ever freeze entire loaves for longer periods? 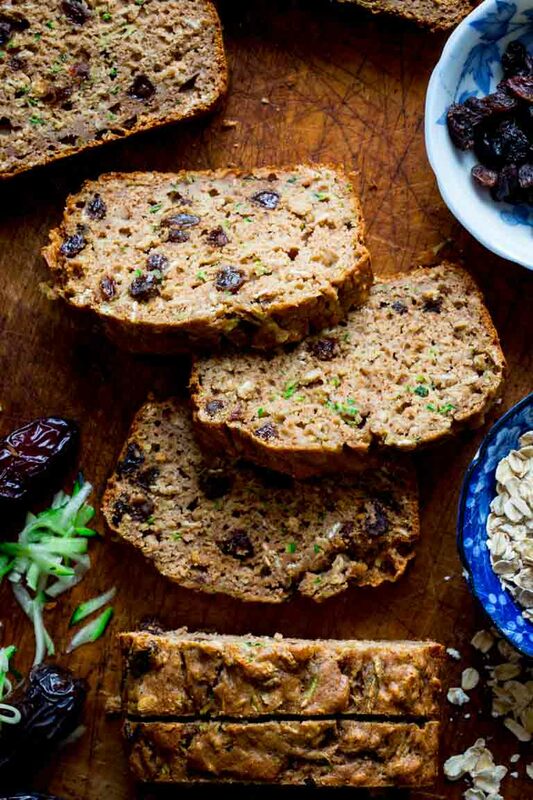 Last year I froze tons of zucchini bread and we’ve been eating it all winter and are still working on the last few loaves, but I’d love to use this much healthier recipe if it freezes well! I wish I had tried to freeze this whole so I could give you a good answer. I am a little worried about all that moisture in the zucchini causing it to get mushy when it thaws. If you do try it please report back to me. I will try it as soon as I have a ton of zucchini on my hands. I made this yummy loaf for lunches a couple weeks ago and now I’ve come back to make it again! I cut it into slices and froze half of it so that it would stay fresh a little longer. Near the end of the week I would just put a frozen slice into the lunchboxes and they seemed to thaw out just fine. That’s what I did too. I froze slices of it (individually wrapped) and just popped them into the lunchboxes in the morning. It is such a huge compliment to hear you’re making it again. I am so happy! I would live to make these in muffin form. Amy suggestions on modifications or timing? Thanks! I did bake these in muffin form last fall. I can’t remember exactly what modifications I made, but I do remember they came out well. My suggestion would be to keep the oven temp at 350 degrees, and set the timer for 22 minutes. They will probably take about 22 to 25 minutes. Test to see if they’re done by gently pressing on the tops. If they spring back to the touch, try the toothpick trick too just to be sure. Sounds yummy!I don’t have dates. What could I use as a substitute? The dates provide a lot of natural sweetness and moisture. Try straining 1 cup applesauce in a coffee filter for several hours and then add tablespoon or two of brown sugar. Hi there! Do you have to drain the zucchini? And would coconut oil work? Hello Mary, Thanks for your questions. You don’t have to drain the zucchini. Coconut oil would work great. Just make sure it is liquid before using it. Can I use dried dates? Are you talking about the ones in the box that are chopped up and tossed with a bit of sugar to prevent sticking? Those are fine, but may need to soften a bit more. Say 30 minutes. I already have a batch of date paste made. Would you recommend that I use one cup? I don’t have my test here in front of me so I am not sure what the yield was. I would say 1 cup plus 2 tablespoons or 1 1/4 cup. Just note, this date paste was pretty loose, meaning it had a lot of water in it. If your paste is thick, like peanut butter, try thinning it a little first. 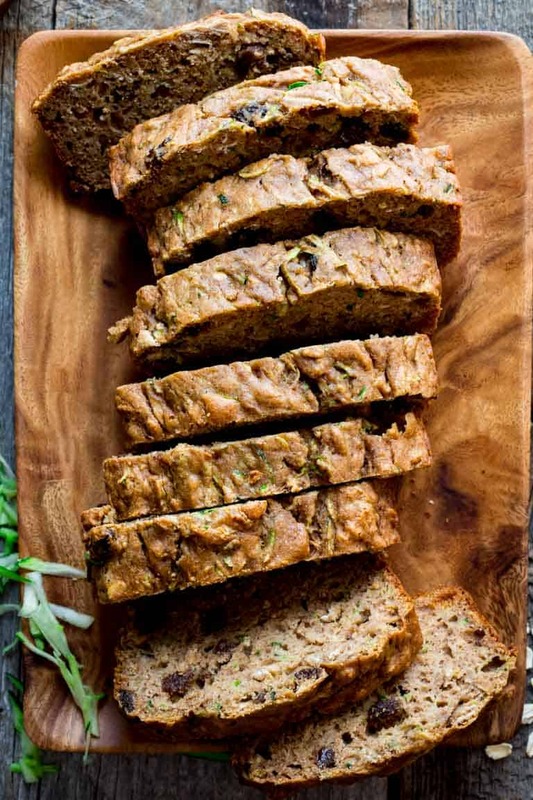 This zucchini bread is amazing! Thanks for sharing. I’m so glad I found your blog, I’ll definitely be back. can you use frozen shredded zucchini in this recipe? I am afraid I haven’t tried. I would suggest starting by swapping the flours for a straight up GF blend. I really like the King Arthur Gluten free baking mix. And of course you’ll want to use GF oats. Theres a chance that the bread will be very tender when it is still warm, so you may want to try letting it cool completely in the pan, then turn it out. Good luck, and please report back! Looks like a wonderful recipe…thanks! Do you think applesauce could replace the oil? I’ve baked oatmeal muffins that way, but they didn’t have zucchini. My hubbie had bypass surgery, so we’ve cut way down on fats. I haven’t tried applesauce in place of the oil in this recipe. I worry that would make the bread too wet. As you mentioned the zucchini is a factor- which also adds moisture. Maybe start by swapping half of the oil with applesauce. If my math is correct, that will give you about 1/3 teaspoon oil per slice of bread. Hope that helps! Thanks! Well. I made it using 1/2 cup of applesauce, but drained the zucchini (and saved the juice for a smoothie). Unfortunately, I couldn’t find medjool dates, so I had to use the s word. It came out GREAT! I will definitely be making this again! THANK YOU SO MUCH! Glad to know it worked out! Have a great day. Thank you for all your work in testing to make this perfect recipe! Our family loves it. I have made it a few times, always as written (with regular whole wheat flour and avocado oil), and I just love dumping that huge bowl of grated zucchini into the rest of the ingredients, which are decently virtuous as well. 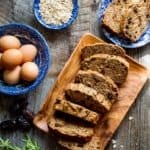 This was the first recipe I tried when we started overhauling our quick-bread and muffin making with non-refined sugars, and it’s my favorite! Thanks a million! I think that should be fine so I would say, please feel free to try it. It should not effect the texture of the bread too much. Let me know how it goes. I’d love to know what you think. 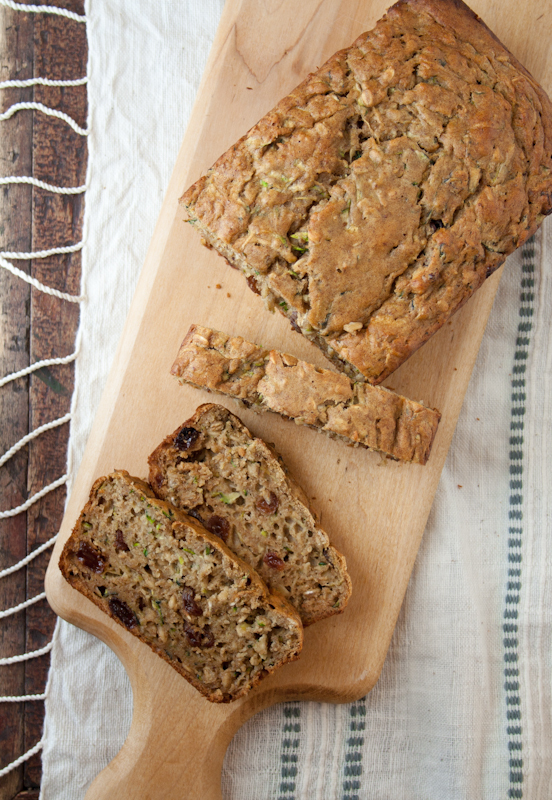 Hi, this looks like an amazing version of Zucchini bread! 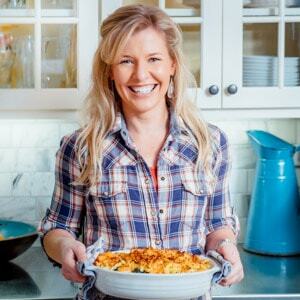 Has anyone tried substituting ingredients to make a Gluten Free version? I’d love to hear the substitiutions.